An Alberta teacher is rescuing seven dogs from war-torn Afghanistan and bringing them to foster homes in Canada. Spencer Sekyer of Sherwood Park, Alta., has spent summers teaching in some of the word's most difficult places: Sierra Leone, the Middle East. But 18 months ago he was in Kabul and stumbled upon a litter of newborn puppies in a gutter outside a guesthouse. Their mother had been abused. "I cannot begin to tell you the abuse that I saw this dog endure," he said. "But she was just the sweetest little thing. She would roll over on her back and just want a tummy rub like every other dog." The white labrador cross puppies were so small they could fit in the palm of his hand. "Even though they're born in a gutter, puppies are puppies and they're sweet and cuddly," he said. "That's what kind of tugged at my heart strings." Sekyer took care of the puppies during his stay in Kabul, feeding them and having them treated for fleas. "The school I was teaching at was kind enough to let me keep them there because dogs are not held in high regard in that country." A couple of the pups were later adopted out and went to a local guesthouse. 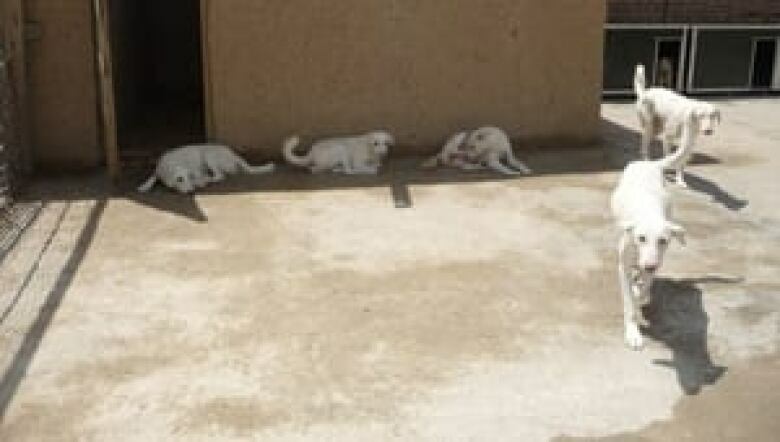 And when Sekyr left to come home, he arranged for the remaining seven puppies to be taken in by a shelter. Eventually the Afghans could no longer keep the dogs and that's when Sekyer decided to try to find homes in Canada. But it's been a trying process: it costs $4,000 each to ship the dogs to Canada. Sekyer fundraised by climbing Mount Kilimanjaro with his wife, Christie. He also posted a video on YouTube that was seen by an Air Canada employee, who offered help getting the animals to Canada. The dogs are to arrive in Calgary on Friday afternoon. "People say things like you know there are animals here that also need homes and I fully support that, I appreciate that," Sekyer noted. "But I guess the difference is I did't walk across them. If I were to walk across a ditch full of puppies here I would do the same thing. A puppy is a puppy just like a child is a child. And I just felt it was the right thing to do whether it's in Afghanistan or Canada. It was just the right thing to do." Sekyer says it hasn't sunk in yet, that he'll believe it when he sees his friends with their paws on the ground. And soon he'll need to find homes for the critters as some people who had committed to taking them in have backed out. A local trainer has offered to donate time to train the animals, said Sekyer. "They're sweet sweet dogs but they haven't been trained, they've never been on a leash. They've never been inside. They've never been on walks. I haven't seen them since they're small so I don't know how well or poorly behaved they will be."